We had a change in plans because of the warm temperatures and sunny and dry weather. We spent time in Leland taking the cover off the old boat and starting to get it ready to ship to the new owner. Yes it is sold, it will be hard to let it go. 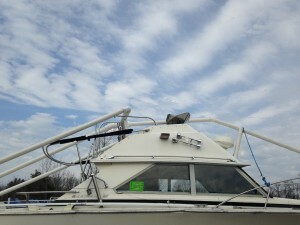 I have had the boat over twenty five years and have put many a mile on it. Then we went to the Tiara in Northport and started the reconstruct of the swim platform and stringer. We did a lot of work prepping the areas. We pulled as much loose wood out that we could and then ran the vacuum to get the last little bits. Using a syringe and needle I got from Tractor Supply, we injected all the area with a product that will harden any wood that is left. We left the dryere running and will start the epoxy fill in a couple weeks. Weather here has sure got me thinking about being on the boat. I sat in the captains chair for a while thinking about this summer, cannot wait. Have started hull preparation for waxing. Used a vinegar solution to wipe the hull to remove the water spots. We will be waxing in the next few weeks. this is what the boat looks like after we took off the cover. The pvc fram is my design. Love our trips to the boat on Tuesdays. Especially after the change in temperatures up north the past week. Had about 50 degrees on the ski hill on Friday. Still a lot to do. I think this week will be installing the new scupper, doing more cleaning, maybe starting to work on filling the holes in the swim platform where the davit was located. The davit fill is really interested and I am still trying to find the best way to do this. If you have an idea let me know. Right now I am thinking of liquid epoxy, bondo, or perhaps marine tex and then painting with a matching gelcoat.